Experience the comfort and warmth of a handmade fur blanket from Master Furrier Lars Paustian today. Make yourself some warm winter days with our genuine handmade Canadian raccoon fur blanket made from high-quality furs from Fur Harvesters. 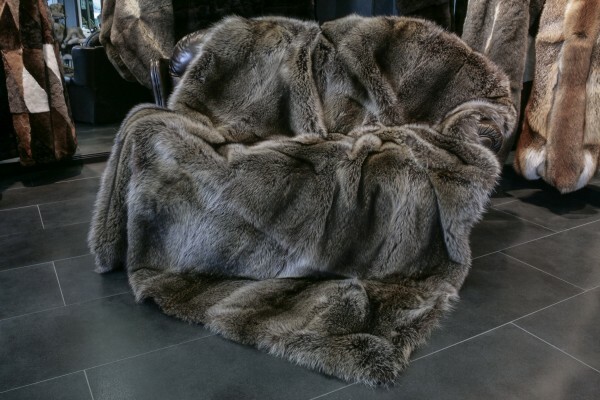 We manufactured this raccoon fur blanket with an anthracite wool back lining and a German soft wadding inlay made from 100% wool. We also chose to use high-quality raccoon pelts from the Fur Harvesters fur auction to ensure to use the best material for our fur blankets. The raccoon pelts origin is Canada, and the blanket wears the OA-Label (Origin Assured). The Raccoons population is controlled to, because of its impact on their ecosystem, and to minimize the risk of overpopulation. We can manufacture this fur blanket in the size you want; please just contact us, we will gladly give you more information. Related links to "Canadian Raccoon fur blanket"
Customer reviews for "Canadian Raccoon fur blanket"
Very nice doing working with you and your company! Just a quick note to communicate delivery of the beautiful fur blanket. I sent you a picture in an email that shows the new home. LOVE LOVE LOVE it!! I did not expect it to be that soft! The raccoon fur blanket is very soft and warm, and the quality is very good. Just what I needed for this weather. I got the natural raccoon color because I have my room decorate in black and white and it blends in perfectly with my all white comforter. I have just received the goods all in exellent order. They are very beautiful and I am very satisfied with the quality.